The Corniche Heritage 40 watch is not only elegant and classic, its beautiful and made from the finest watch materials Sweden has to offer. The Heritage 40 features a gorgeous set of ceramic dials covered in either a beautiful stainless steel watch case or a Rose Gold version for the one looking for a more classic looking timepiece. The Heritage 40 also introduces a completely new case back, featuring an engraved Mediterranean pine tree, a Cote D’Azur classic and one of our absolute favourites. The watch is fitted on a genuine leather strap with a matching clasp and comes delivered with outer box, piano lacquered wooden box, owners manual and certificate. Order your Corniche Heritage from their site – click here! 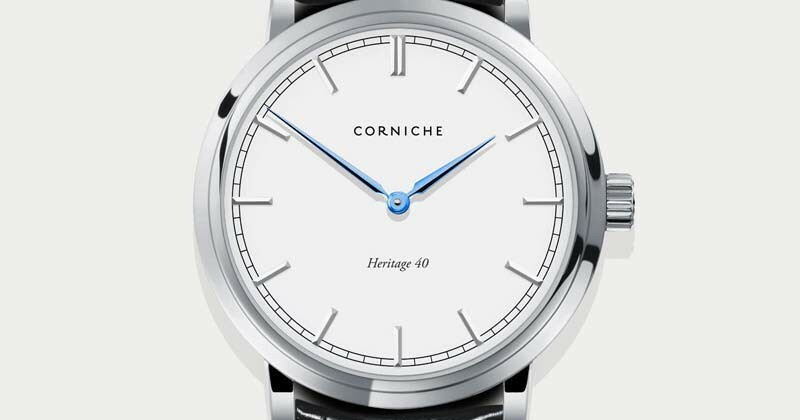 Corniche Heritage 40 : Corniche Watches 0 out of 5 based on 0 ratings. 0 user reviews.